Do You Believe? All Things are Possible. “Jesus said unto them, If thou canst believe all things are possible to them that believe” (Mark 9:23). Why do we have our minds set on expecting little, when the banquet table is spread before us, and it is an abundant supply. Too often we are fearful; when we should be faithful. Has God ever failed you? Sure, sometimes He may delay your answer to the prayer that you’ve been praying about for years. We must remember that Jesus works in a different time frame than we do; when we learn how to trust; He will teach us how to persevere. The Lord is preparing me to be a vessel that can be used and when I get caught up in the daily routines I may forget to spend quality time with him. God is a jealous God, and He is to be your priority. Everything else is secondary, because he is God. We learn to die daily to self, and quite honestly, it isn’t always easy to wait on God, but He requires it. Every situation we’re faced with has a solution, and we’ll know when all is said and done, that God is in charge of our lives. When we have success; it is only because God allowed it. When we have failure; it is only because God allowed it for our good. The longer we live, the more we’ll understand that He reigns; so, we have no need to fear. What if my shield of faith is scarred with disappointments; and my vision has been battered by doubts and delays? Should I quit trying? NEVER. I’m not about to give up on God, or on myself. I know in whom I have believed, and he is able to deliver me, and rebuke the devourer on my behalf. When the Lord led me into the writing ministry, I followed cautiously. When He gave me the vision for a ministry, He immediately required for me to give it all back to Him. I was instructed to lay the writing ministry down at the altar, and be willing to walk away from it. My affections must be set on things above. That was twenty-one years ago, and I have been richly blessed to continue to write what the Lord gives me to share. For me, writing is an act of worship, not just a hobby that I like to do. If we’ll wait for the Lord’s plan for our lives to unfold, the promise will come to pass, because God can’t lie. We can waste time in worry about the future, or we can start planning to receive the future that the Lord has already worked out for us. it is our choice: Do we dream about what might have been? or, do we step out in faith and claim the promises of God? There is a path in your walk with God that requires a greater sacrifice. As we take steps of faith in the physical realm; a battle rages for our souls in the spiritual realm. In the intensity of this battle, we may get overwhelmed with the pressures of life. Our prayers develop into deep intercession, and the weight of our burden almost consumes us. Don’t allow it to overtake you: persevere until you have found peace. 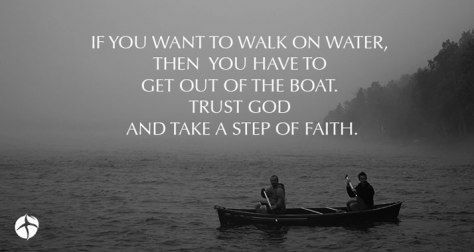 The Lord is calling us to get out of the boat, and walk on the water. It’s time for a deeper anointing, stronger commitment, and a steadfast unshakable faith to take us through to victory. I made a choice to serve the Lord with gladness, and I am thankful that every day that I live, I can know that I made the right decision. “The Spirit of the Lord is upon me, because he hath anointed me to preach the gospel to the poor; he hath sent me to heal the brokenhearted, to preach deliverance to the captives, and recovering of sight to the blind, to set at liberty them that are bruised, To preach the acceptable year of the Lord” (Luke 4:18).